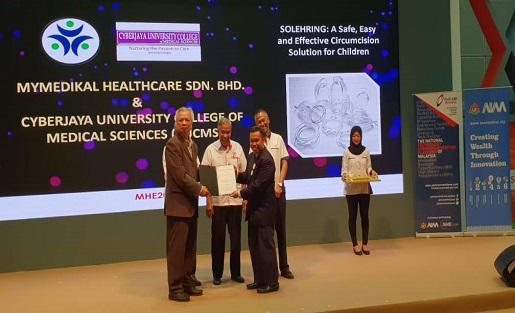 Dr. Mohamad Salleh bin Abdul Aziz, senior lecturer from the Faculty of Medicine from Cyberjaya University College of Medical Science (CUCMS) is the proud recipient of the ‘Islamic Innovation Challenge (IIC)’ award for his groundbreaking invention, ‘SolehRing’. Kuala Lumpur, 25th January – Agensi Innovasi Malaysia (AIM) and its subsidiary PlaTCOM Ventures Sdn Bhd (PlaTCOM) in collaboration with SME Corporation Malaysia (SME Corp) and Department of Islamic Development Malaysia (JAKIM) recently organized the ‘Islamic Innovation Challenge (IIC)’. The IIC award celebrates the best Islamic innovations across the country that can transform the lives of citizens, drive innovation and win in the digital economy. This year, the organizing committee recognized Dr. Mohamad Salleh bin Abdul Aziz, senior lecturer from the Faculty of Medicine from Cyberjaya University College of Medical Science (CUCMS) as the proud recipient of the IIC award. His new technique and innovative device to overcome complicated and painful circumcision in children was selected by the judging panel as the overall champion. Dr. Mohamad Salleh bin Abdul Aziz receiving the award from CUCMS President, Prof. Dato’ Dr. Mohamad Abd Razak. Approximately 1.5 million children are circumcised each year in Malaysia and most of them undergo the procedure using disposable devices. Most of these disposable devices carry at least a 37% risk of complication to the user. Dr. Salleh’s invention ‘solehring’ is able to reduce such complications and ensure a safe and risk-free circumcision procedure. However, success did not come easy for Dr. Salleh as funding was a major issue for the inventor. “I have to fork out my own money to develop the 3D design, as well as prototyping and manufacturing”, Dr. Salleh mentioned. “The purchase of raw materials and marketing is still a challenge for us, but we remain positive in the long term”, he added. Following his accomplishment, Dr. Salleh will be applying the same methodology to create a circumcision device for babies and adults. IIC was opened to SMEs throughout the country and 60 companies were selected to compete in the challenge. They participated in eight different modules of Islamic Innovation training and entrepreneurship and went through intense product development with established hi-tech industry leaders. The main objective of the IIC is to discover the hidden top Malaysian SME gems of Islamic innovation in Malaysia, which were chosen for commercialization and funding.